Clayton Swart at International Yacht Collection tells me of a $600,000 price cut on the 36m motor yacht Shalimar, a joint listing with his colleague Bruce Schattenburg. 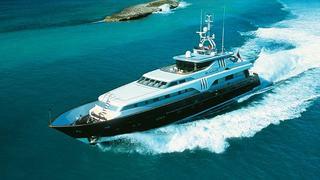 Built by Azimut in 1994, she's a tri-deck raised pilothouse yacht with a large open aft deck. Accommodation is for 10 guests in a master suite on deck plus four further staterooms, while twin 2610hp MTU engines give her a cruising speed of 12 knots. Shalimar is now asking $5,599,000, down from $6,195,000.